Honor, bravery, loyalty–these made up her ma’tan sarili, the three values. I was an everyday Kalusian greeting, but it meant much more than hello or goodbye. It translated to “highest self,” and to say it was a pledge to be the best person you could be. In a time of heightened political turmoil, Empress of a Thousand Skies is relevant more than ever. Even though this is a space opera, the story parallels the contemporary world we live in. It’s a tale of Crown Princess Rhiannon Ta’an, the last of her clan, who’s determined to avenge and reclaim her throne. It also interlaces the fate of Alyosha, a refugee reality star, who was falsely accused of killing the future Empress. It’s an epic battle of planet wars, heroic rebellions, vengeance, and the true spirit of a dynasty which is freedom and unity. Empress of a Thousand Skies has a deliberate pace with dauntingly technical world building. It’s set in a galaxy with diversified planets and moons. Every habitat has complex culture, mythology, language, religion, and social constructs. Some species are also different than others. There is a cult-like appeal. The politics and nuances are well established. There’s an intricate structure of classism and racism. It’s by far my favorite aspect. The heroine, Rhee grew up only knowing survival instinct. She’s always in a defense stance–wary of people attempting to kill her. She grew up only wanting to avenge her dead family. She’s an orphan who’s not allowed to go home. An empress without a throne. Then there’s Aly. Another war orphan who only knows survival. He who has been hardened by the horrors of humanity. He’s a refugee who only wanted the basic needs of life. Though fate loves nothing else but to spite its heroes. The characters are relatable, you can’t help but root for them. You won’t agree with their choices sometimes, but you can also understand where they’re coming from. I love the barbed humor, especially Aly’s. Rhee’s naïve ruthlessness, her strangeness to power. The privilege was also acknowledged. I did see some of the twists that were thrown in, but damn that epilogue will certainly string a handful of readers. I shed a tear. There’s no romance, but there’s an underlying possibility. I’m excited for all the things the sequel would explore! 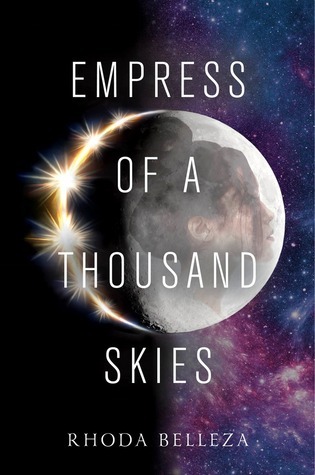 Empress of a Thousand Skies is perfect for Star Wars and SAGA fans. Do you want to read a refreshing story about resistance led by brown and black characters? It’s time to pick up Empress of a Thousand Skies. This is the revolution I could get behind.